Lazlo Almazy: pilot, explorer, soldier, spy. "Lazlo was the least charismatic of the two Almazy brothers" recalls former jet-setter and Egyptian polo champion Victor-Mansour Semeika. "Janos was the convivial bon viveur always surrounded by beautiful women. Lazlo was an introvert with a bit of an inferiority complex but the one with the most diverse life experience. His rise to fame started when he caught the attention of Egypt's great desert explorer Prince Hussein Kamal al-Din. It was I who introduced him to the prince!" Semeika, 90+, remembers Lazlo Almazy well for both men were friends of Prince Youssef Kamal who not unlike his cousin Prince Kamal al-Din had a penchant for the outdoors. A descendant of Viceroy Mohammed Ali who ruled Egypt the first half of the 19th century, Prince Youssef was world famous for his horsemanship, his globetrotting hunts, his love for the arts and most importantly, for his generosity. Although Ladislaus "Lazlo" E. Almazy (pronounced Alma-jee)--an engineer with the former Austro-Hungarian auto firm Steyr--appeared on the Cairo scene during the interwar period as a businessman-engineer, yet no one seems to recall Almazy for his industrial contacts. Instead he is remembered as an explorer, a self-proclaimed geographer and a daredevil pilot, elements no doubt which made The English Patient the success it is. "One thing the multilingual Lazlo was not" says Semeika who hasn't seen the movie, "a dashing Casanova". Lazlo Almazy and his brother Janos lived in Castle Bernstein, a medieval fort-like abode situated on a dominating hill in Austria's parochial Burgenland which borders Hungary. Whereas in Europe Janos was the grand host and socialite, it was Lazlo who became the more recognized in Cairo and thereabouts. "In those days several Egyptian princes hunted pheasants and gibier in the large estates bordering the woods of Hungary and Prince Youssef Kamal was an habitue. The middleman for these grand affairs" recounts Semeika, "was Janos Almazy." It was through Lazlo Almazy that the Egyptian prince and his limited entourage arranged for the best hunting lodges money could buy. The term used then was "acheter une chasse." Semeika, then a regular guest at Almazy's Budapest home, recalls how the walls of the main hall were decorated with the heads of 40 African water buffaloes. According to the Hungarian Observer, Lazlo Almazy was doing the same thing in reverse: organizing African safaris for Austro-Hungarian aristocracy. Semeika recalls that one of these hunting expeditions was for account of Duke Antal Esterhazy in 1926 and another the following year for Count Szigmond Szechenyi. Both were acquaintances of Prince Youssef Kamal whose own hunting expeditions had taken him to Kenya with Janos Almazy and Victor Semeika as his personal guests. 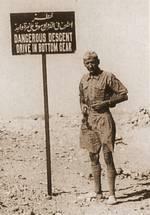 In time, Lazlo Almazy was soon working for the British-run Egyptian Desert Survey Department. 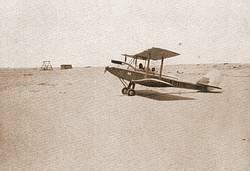 In his spare time he was either tinkering with, or piloting, a de Havilland Gypsy Moth over Egypt's uncharted territories. Perhaps Lazlo being his father's son had something to do with the ways things turned out. Gyorgy Almazy was one of the most famous travelers, zoologist and ethnographic explorers to have visited Central Asia. His legacy may therefore explain the son's dogged determination to travel the limits of Egypt's outback starting with the Western desert. This was also the same desert where Prince Kamal al-Dine was leading a costly overland expedition for the discovery of the lost oasis of Zarzura. The prince spent considerable amounts equipping his desert armada with especially-built Citroen caterpillars. As there was no sight of Zarzura anywhere an air survey was necessary and Lazlo was just the man to do it. Crisscrossing the vast Western desert in his Gypsy Moth Almazy discovered between 1932-36 al-Gilf al-Kebir, a granite massif as large as Switzerland once the habitat of prehistoric humans long before the African Sahara dried up. Other discoveries--although some were later disputed--attributed to Almazy was Wadi Sura or Picture Valley with its fantastic cave drawings and later, Gabal Oweinat. By then the nomads of the area had nicknamed him Abou Ramla or father of the dunes. The airborne nomad was a legend of the deserts. 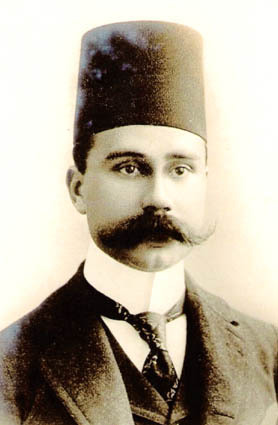 Through his discoveries Almazy became a prominent member of the Royal Egyptian Geographical Society where many of his finds and theories were discussed and published. The patronage of King Fouad no doubt opened many doors for the adventurous Magyar. Years later, Fouad's son, King Farouk, would consider Almazy for the position of director of the Desert Institute, but the latter's death would prevent any such appointment. It was during one of Lazlo's treks into Egypt's Nubian outback of Wadi Halfa that Lazlo Almazy pitched his hypothesis that Magyar prisoners were brought to Nubia by the Ottomans in the 16th century to act as border patrols. (Turkey occupied Hungary from 1529 to 1687). But as five hundred years separate us from that period, the browning of their descendants ostensibly took place which is why there are no striking physical characteristics discernible today that confirm Almazy's theory, except for the fact that some light skinned Nubians claim descent from the Danube. Before being portrayed as a explorer, soldier, lover, spy, in Michael Ondaatje's book "The English Patient" (First Vintage International Publication, December 1993) Almazy had already been immortalized in several faction (fiction-action) works including Ken Faulet's "The Key to Rebecca" where he was portrayed as a Libyan desert explorer in the service of the German Wehrmacht. When WW2 broke out, Lazlo Almazy, a veteran pilot from the First World War, joined the pro-German Hungarian air force and was promptly seconded to the service of Lieutenant General Waldemar Kenese who in turn passed him on to Rommel's Afrika Korps where he was promoted to flight lieutenant teaching the German flyers rescue, first aid, and survival tactics in desert warfare. Semeika does not believe Almazy had any strong affiliations with the Nazis. "If he had any affiliations with the Nazis it was never been more than a casual matter which may have had its origins when his brother Jan?s and Adolf Hitler were being simultaneously courted by the flighty British aristocrat, Unity Midford." As Rommel planned his African campaign, Lazlo Almazy's erudition of the Libyan Desert was in demand. 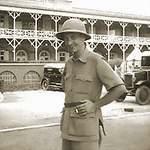 One of his wartime missions took place in May 1942 when he planted a German agent in Egypt via a grueling overland route which spanned the entire Western Desert ending a few kilometers from Assiout. This is how John Eppler was smuggled into Cairo only to be caught by a vigilant wartime police a few months later in his rented houseboat next-door to the one belonging to Egypt's renown bellydancer-agent Hekmat Fahmy. 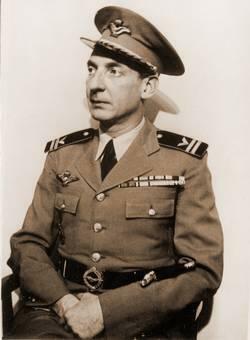 After the war, Almazy was indicted by a Hungarian court of law for having collaborated with Rommel and for allegedly having written a wartime German propaganda book. Charges were dropped thanks to the favorable intervention of Hungarian orientalist Gyula Germanus (the former professor of the incumbent Hungarian ambassador to Egypt Mr. Erno Juhasz). Lazlo Almazy died on 22 March 1951 in Salzburg (where he was buried)following a protracted illness. It would be four decades before he was resuscitated in his ancestral home on a Hungarian stamp commemorating the 100th anniversary of his birth. Casanova or not, two years later Ralph Fiennes in The English Patient would eternalize Almazy as an ascetic romantic. The legend of Abou Ramla lives on. Correction: In my earlier article dated April 13, 1995, I had wrongly inferred that Almza Airport was named after Almazy. This was disproved by historian Lucien Toutonji to whom I am indebted. Well, I hope you haven't lost interest in Almasy. Two weeks ago a new book was published on him, thus that interview with the respective author revealing new facts on his life: Almasy was the son of a Hungarian explorer and his Styrian wife [Styria = southern province of Austria]. He was born at Bernstein Castle in Western Hungaria, a part nowadays belonging to Austria [Burgenland]. He was quite influenced by his gifted father and spoke six languages fluently: Hungarian, German, English, French, Italian and Arabic. At 14 he constructed automobiles and gliders, at 17 he received his pilot license. After the Habsburg empire had collapsed Almasy acted as driver to the former emperor Charles I. When Charles [Karl I.] tried in vain to be reinstated as king in Hungaria, he was raised into the (then non-existent) position of a count (voila, that's why he called himself VON Almasy). Even though Almasy never expressed his political ideas he always remained - according to that biography - "a romantic conservative". 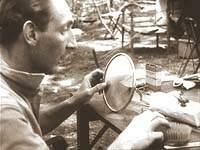 In the early 20s he earned his money as test driver for Steyr-Daimler-Puch in Graz. He wanted to sell cars to Egypt and convinced his employer to test Steyr cars in the desert. Thereafter he organized hunting trips for Prince Esterhazy [the Esterhazys owned most of Western Hungaria, and they still own half of Burgenland] and Prince Ferdinand of Liechtenstein. He flew with his "Moth" from Hungaria into Egypt and started to explore the desert, focusing on the eastern Sahara. In his expeditions, he combined cars and planes and discovered the remaining unknown parts of the Libyan desert. The Egyptian government finally hired him as cartographer. His discovery of those prehistoric paintings are also depicted in 'The English Patient'. He published all his findings in his book "Die unbekannte Sahara" [The Unknown Sahara, 1934; I found a copy of that oeuvre]. During WWII he offered his services to the Africa Korps. We know about those spy stories and his alleged relation to Rommel (well, I never...!). Actually, there are rumours that Almasy cooperated with the other side by handing over secret documents to the Long Range Desert Group. From a fellow conscript, an interested ethnologist, I heard the story that he might have even been conspiring with the Soviets. As a matter of fact, he was arrested by the latter before being released in 1947 in a more than poor state of health. He escaped into Burgenland and returned to Egypt where he worked as flight instructor. 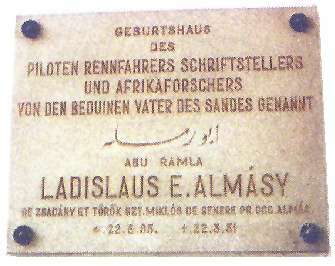 In 1950 Almasy tried to re-establish contact to the desert academia he had known before the war. He was offered to head the Desert Institute in Cairo, but unfortunately died in 1951 of dysentery. Don't know if those are any new facts for you, but still Almasy didn't lose his attraction to me! An impressive, but tragic fellow! Concerning your article about the English Patient: Egypt's celebrated hungarian brothers, I have researched and read alot about him all around the web and found out he was homosexual, and he was known for a special relation with one of the beduins, sort of like Lawrence of arabia, who I hope you write an article about his stay in Egypt and role in the region. My grandfather knew Laszlo and there are a few points I want to correct. Uwenat and Gilf al Kebir were already known to the Egyptians Bedouins who sort of took them for granted. Kemal ed Dine wrote an article on the caves for National Geographic before Laszlo ever went to Egypt. Laszlo distinguished himself by going to each cave recording the decoration. As for Hungarians in Egypt there was a village of them descendants of a Nile janizary garrison Laszlo spent some time with. I was very interested in your article about the Almazy (Almasy) brothers, as my father-in-law, John (Janos?) Almasy was born, possibly in Austria in 1897. He was brought to the United States by his mother, Mary (Maria?) Almasy when he was 2 or 3 years old. Apparently Almasy was her maiden name, and she placed him in an orphanage in Metamora, Illinois shortly after arriving in the country. He did not like to talk about his family, so we never learned much about his heritage. He settled in East Peoria, IL and died in 1972. Would you know of any other Almasy relatives that I might contact for information about the Almasy family? I realize he was not necessarily related to Lazlo or Janos, Did either of them leave heirs? Any information you might be aware of would be appreciated, but I understand if you can't help. Thank you for your attention.